Nature has that special power to calm the mind, soothe the frazzled nerves and rejuvenate a weary urbanite. It is thus not surprising to hear of property developers incorporating in their designs patches of gardens and greenery that will provide its residents swatches of nature right at their own backyards. And while these developers have striven hard to provide any semblance to nature through these little colorful patches, one real estate firm does just the opposite. The Grove by Rockwell Land Corp. boasts instead of a 75-percent open and landscaped environment and a 25-percent building ratio within a 5.4-hectare development, highlighting the majesty of greenery in the middle of the metropolis. The Grove is a complete contrast from the typical urban development of hard-edged structures of glass and concretes, as it “features tropical contemporary architecture, landscaping and interiors,” according to Alice Erfe, principal architect at Erfe & Associates. “Interior design complements the exterior architecture with the use of natural materials such as wood, stone, crushed bamboo on accent details to create green and cozy elegance,” Erfe told Inquirer Property. According to Erfe, the main inspiration for the design of The Grove was nature—with the sky, earth (landscape) and water interpreted in accent colors such as teal blues, blue grays, reds, orange, rust, beiges, fresh greens. These are the same colors used on accent furniture upholstery, artworks and artifacts. Natural materials such as wood, bamboo, shells, stone are highlighted on accent furniture, lighting, artifacts and wall decor—all produced by Filipino artists and craftsmen, Erfe further explained. At The Grove, gardens will be a natural extension of every home, allowing one to embrace nature without sacrificing the comforts of modern urban life and ultimately, this is what sets The Grove apart from other developments. 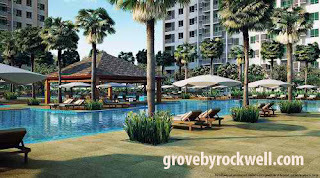 Located on E. Rodriguez Jr. Avenue (known as C-5), The Grove is Rockwell’s first residential enclave beyond Makati. It was launched only in October 2008 and by June next year, units from Towers A and B will already be ready for turnover. To prepare for the turnover, Erfe shared some tips with Inquirer Property so the unit owners can truly maximize that five-star “boutique resort living experience” at The Grove. Measure your unit and make a layout of furniture you want to put in. Select simple designs especially for large items such as sofas and dining sets. You can accent these with smaller pieces of your own choice of design and details. Select neutral colors. Create a neutral shell with neutral walls, ceilings and window treatments such as drapes/blinds and limit colors to accent walls, throw pillows, artworks. This way, you create a cozy feel that soothes the eyes as you enter the unit. Invest in built-in shelves, drawers and ledges that will keep the unit clutter-free. Don’t rush in buying furniture. Be sure it will fit the unit and the style you want. Be careful with proportions, color and style. Determine the look that you want—magazines, the Internet and showrooms offer a wealth of information. Don’t get bulky furniture. Light, functional and simple pieces will make your unit look more spacious. Don’t frame your windows with fancy swags and dark colored drapes. These will create frames that distract attention and make the space look cut-up and smaller. Go for neutral drapes that soften the look but blend with the neutral walls. Given the space constraints, say, with a studio type unit, Erfe further advised owners to create as much space as they can achieve by using the right colors, appropriate lighting and multifunctional furniture. According to Erfe, light colors—whites, beiges, greige (gray with beige)—are the best ones that can be used to open up a space and make it look bigger. Cove lighting with T-5 lights along the perimeter or one side of the wall should be used to highlight the height as well as table lamps or a floor lamp at the corner, and a droplight on top of the dining table. “If possible, add accent wallwashers (inlights) to light up artworks or accent walls. If budget is constrained and cove lighting and accent pinlights are not possible, use a tracklight with four to five spotlights to focus on accents. Do use indirect lighting such as table lamps and floor lamps to create soft mood lighting,” Erfe explained. 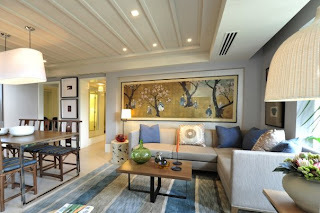 To maximize the space, unit owners should get multifunctional furniture such as a sofa that can serve both as a bed and a dining banquet; a coffee table (cocktail table height of 26-27 inches) that will serve as dining table and work table; light accent chairs and small side tables that can be easily moved around. All the rest can be built-in such as TV cabinets with ledges for bookshelves and accessories, hidden wall units that serve as pantry or clothes storage. “Every inch of space should be planned to achieve best use and function so as to eliminate clutter,” Erfe concluded. Erfe & Associates, which designed the showrooms for The Grove, can also be tapped by individual buyers to design their respective units.